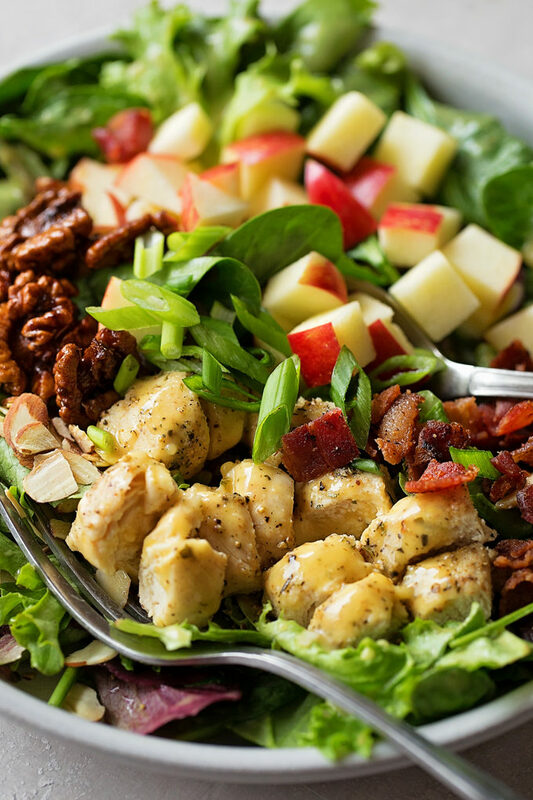 This honey mustard chicken salad is sweet, tangy and loaded with lots of crunch! 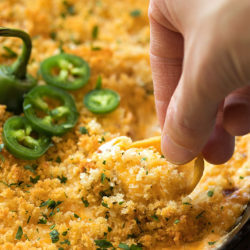 It’s a delicious, light yet filling meal or the perfect flavor-packed side. 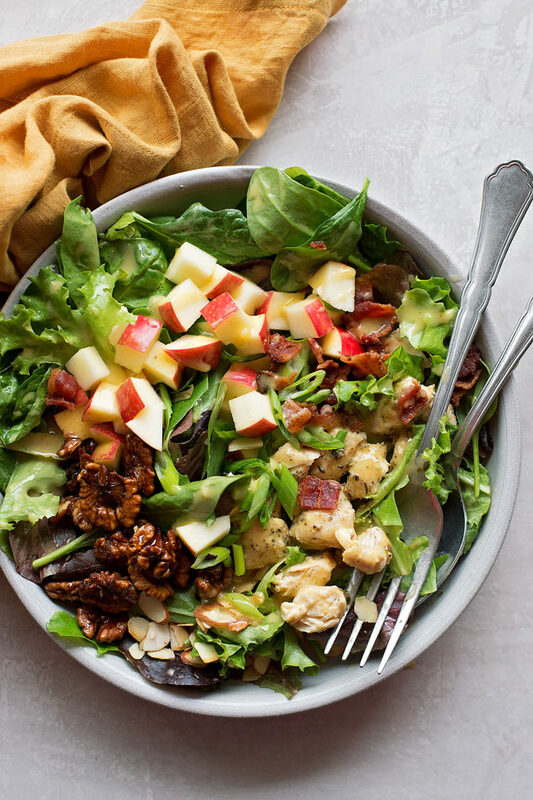 This salad will be on repeat all summer long! It’s loaded with all of my favorite things and ready to go in just 30 minutes. Best of all? My kids devour it! 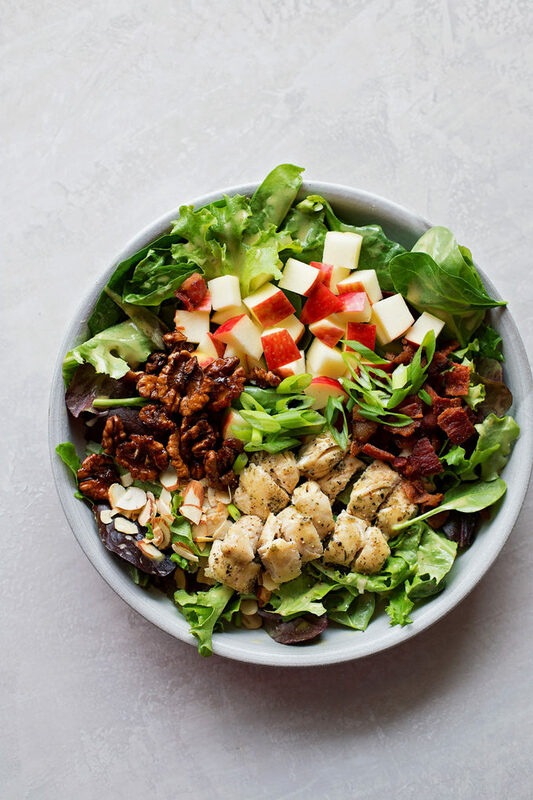 This honey mustard chicken salad was the first and probably one of my favorites because it’s easy. And lately I NEED easy! I’m sure I’m not alone!! I grabbed this dressing at Whole Foods the other day because it was one of the few I could find without some kind of dairy or soy. It’s soooo good! Light, sweet, tangy and fresh tasting. 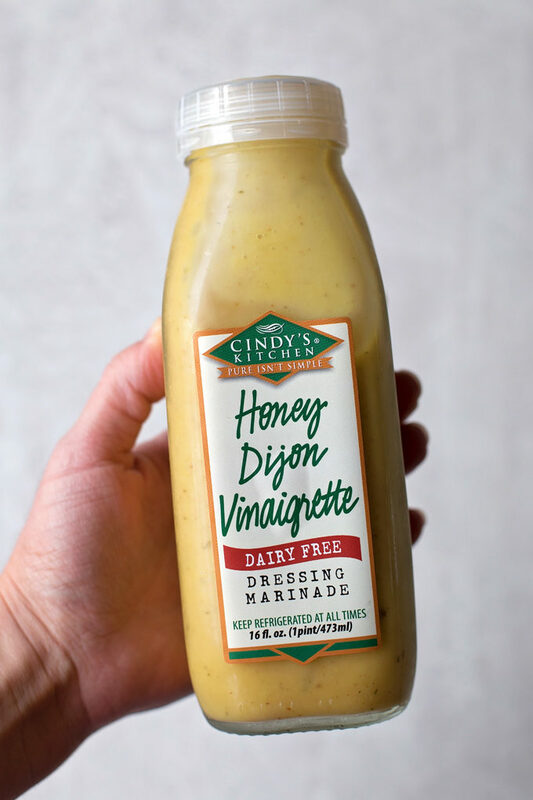 If you saw the Italian pasta salad I shared a few days back, I used another Cindy’s Kitchen dressing and it was also delish! I figured I could use it on greens with whatever we had on hand, and that’s exactly what I did. I cleaned out our fridge and cooked up the bacon and chicken. While they were cooking I chopped up everything else. Everything was done in just under 30 minutes. Pretty good if you ask me! This made an extra large lunch or dinner size portion. 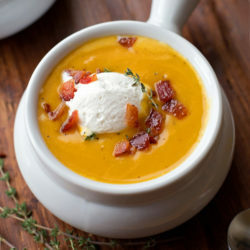 You could easily divide it up into two filling sides or even four small salad portions. I ate this bad boy all by myself. 😋Of course, I did share with my kiddos here and there. We all agreed, I needed to make this again! 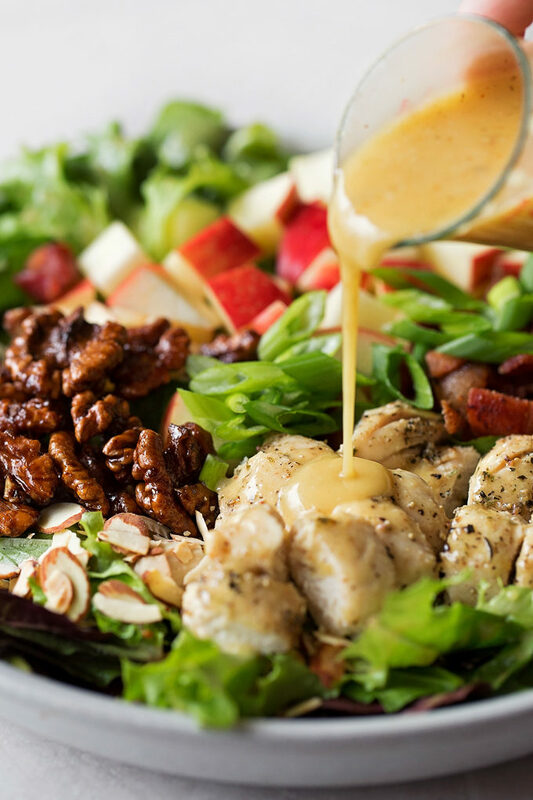 If you’re tired of the same old dinner salad or want something extra delicious to share at your next gathering, you’ve gotta make this honey mustard chicken salad! It’s sweet, tangy, crunchy and perfect for any occasion! While the chicken and bacon are cooking, prepare remaining ingredients. 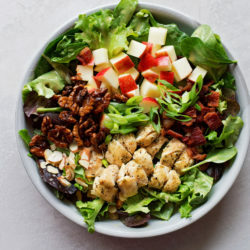 Use a large salad bowl or two medium salad bowls depending on the serving size. Place greens in, then top with remaining toppings. 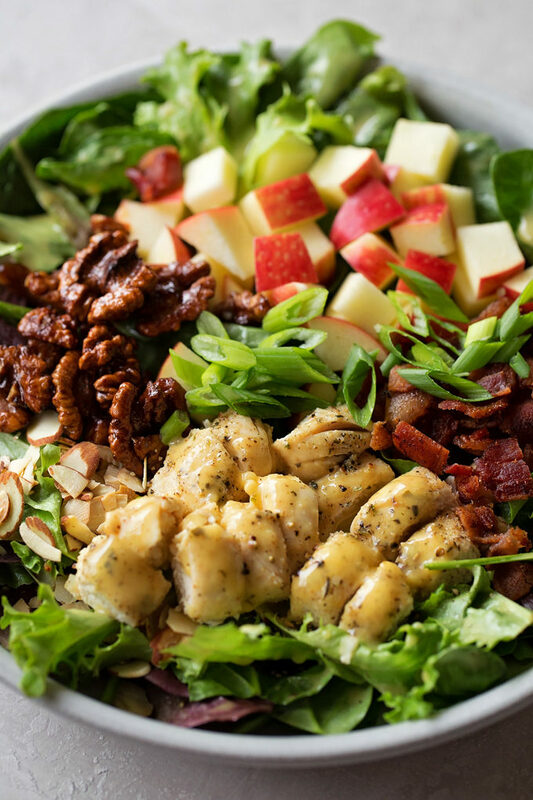 Drizzle dressing over top and serve immediately. * I added a teaspoon of avocado oil, then sprinkled on coarse sea salt, freshly ground black pepper, garlic powder, paprika and whole grain dijon mustard. I baked mine for 22 minutes at 450 degrees until it reached an internal temperature of 160 degrees. 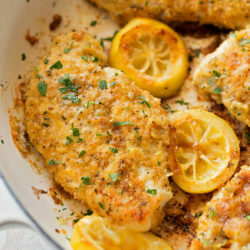 You can always use cutlets or pound out your chicken breast until it’s 1/2 inch thick for quicker cooking.